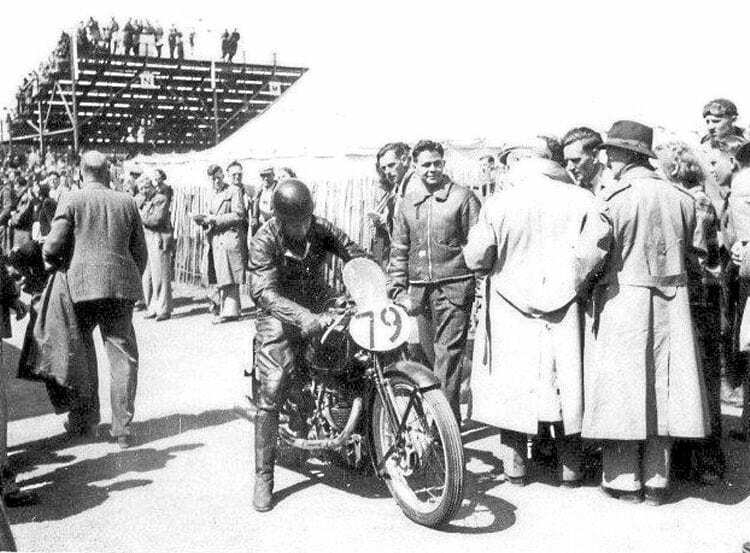 Dreaming of summer – and TT races long ago! 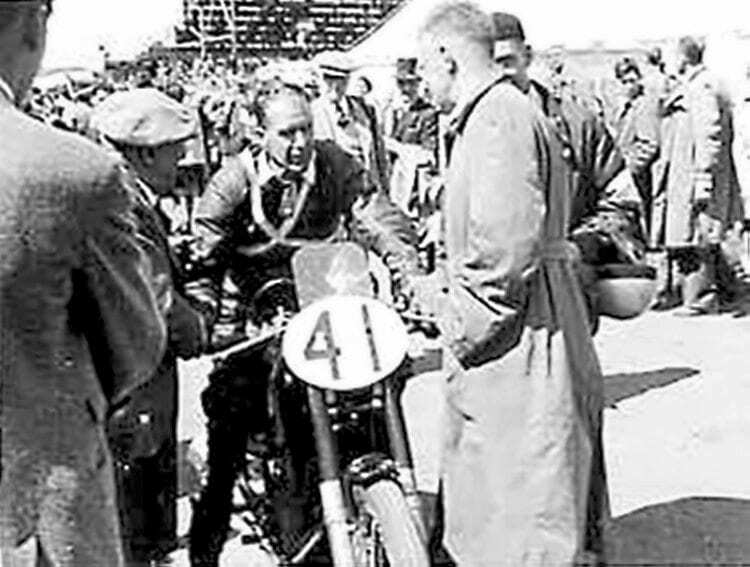 Regular contributor Colin Rider digs out some family photos of the TT during the early 1950s – and gives us the perfect Christmas quiz idea. A small cluster of sidecar outfits and solo motorcycles are parked higgledy-piggledy in the field in front of Mr and Mrs Hughes’ farmhouse B&B at Ballaspur, where members of Colin’s family once enjoyed warm hospitality and great food, as spectators crane their necks for the glimpse of the next TT competitor to come along. Winter… it’s a time when we reflect on summers past and make plans for those to come – and for many motorcyclists it’s a time to look through the family archives and dig out those long-forgotten snapshots from many years ago. 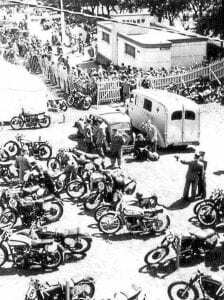 The Art Deco toilets behind the TT grandstand are instantly recognisable as an old-fashioned ambulance stands by and visitors line up behind the chestnut paling fence to study the action going on around the rows of racing machines. Regular OBM contributor Colin Rider recently unearthed a batch of old photos taken of, or by, his uncles during TT weeks of the 1950s, and modestly asked whether our publishers, Mortons Media Group Ltd of Horncastle, would be interested in placing some of them into their archives after sorting through those we thought might be suitable. Historic photos like these are always suitable, Colin, and as an antidote to the short cold days and long dark nights of winter, we could think of no better issue to give them a first airing in than the Christmas one. 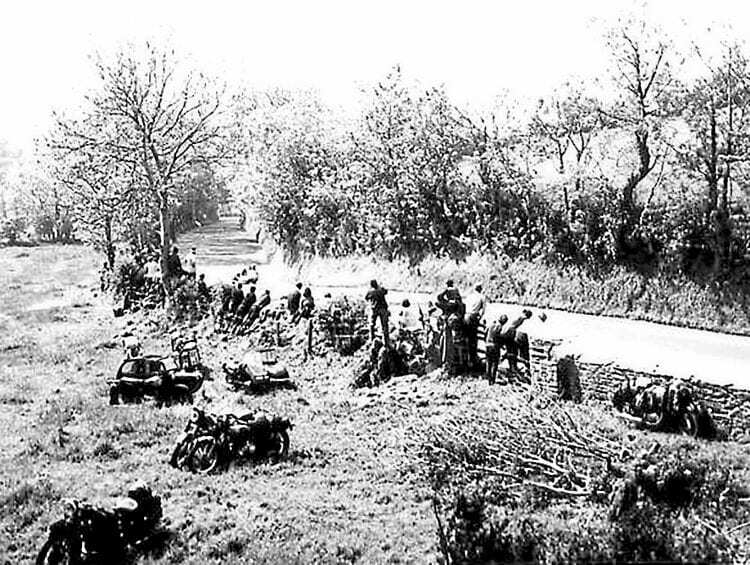 Although Colin cannot identify the riders seen in many of them, we also thought that, as a kind of ‘Christmas quiz’, those readers who can go back to those idyllic days might be able to rack their brains and come back to us on any information about the scenes. Those were the days! Rider No 79 has his right hand on the throttle, and long coats are in profusion as two older men who look like officials cover their heads in a flat cap and a trilby hat. Behind them, a serving soldier can just be seen in his beret. Can anyone fill us in on the details, please? Recognise the rider on bike No 41? Previous Post:Home from the war – on a Coventry-Eagle?